Learn from the Signalhorn's leading industry experts on everything from the creating satellite and terrestrial communications to best practices for securing your network. How do you connect your company to the world if it’s located in the most remote place on Earth? In the 21st century, it doesn’t matter where you are, being “always connected” is vital to your business. 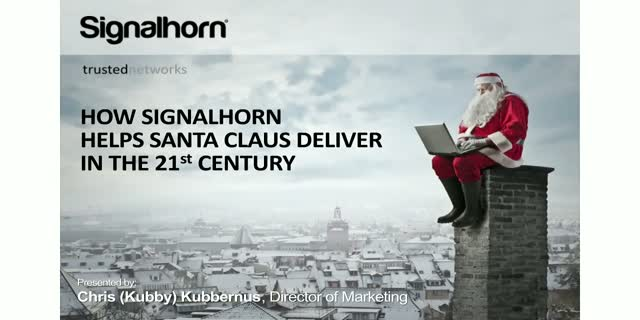 In this special Holiday Edition webinar, you will learn how Santa Claus successfully uses advanced technology in the digital era, to overcome all communication challenges. When he’s travelling on his sled around the world or sitting by the fireplace in his little house at the North Pole, Santa stays connected to keep the business running. And best of all, you don’t need to be Santa Claus to benefit from the best engineered communication solutions for your company. Michael Biederer, Signalhorn’s VP Operations, explains the proactive monitoring approach of Signalhorn. Signalhorn’s Secure-NOC has been operating with the proactive approach for many years. Michael will go into detail about the setup, daily operations, and how Signalhorn customers benefit from this operational approach. Keys to improving network security: Manage adventure in your business venture! Signalhorn’s Chief IT Security Officer (CISO) Istvan Rabai presents an overview of present-day IT security. The focus of this webinar will be on identifying specific vulnerabilities and measures to improve the security of a communication network. Istvan will show - from his own first-hand experience, how an actual incident became the catalyst for the implementation of a state-of-the-art secure infrastructure that currently serves an impressive number of Government, NGO and security sensitive Corporate customers. The webinar will cover several key aspects, but as there is no blueprint solution for all security issues, you will have the opportunity to address yours individually in the Q&A discussion at the end of the session. Most telcos are in the process of migrating their customers to an all-IP environment. An approach enabling multiple services via a single connection, and thus creates a more efficient network and new services. However a single connection failing creates problems of its own. In today’s world an hour off-line can cost a significant amount of money, even for a small business. In our webinar we want to evaluate the risk without dramatizing it and review potential scenarios to mitigate the threat. Enabling you to have a meaningful, fact based discussion internally or with your customer. You have hardworking employees, separated from friends and family for months at a time in remote locations with limited connectivity to the outside world. Maybe they are on an oil platform, on a ship, or in the middle of a jungle. Email may be available, but nothing beats the sound of a familiar family voice to raise the morale of your employees after a hard week of work. Come listen to how you can quickly provide a cost effective and easy to deploy and manage solution with the ability to call home anywhere in the world. Solutions are also available to extend your internal corporate calling across the same link. We provide the link or perhaps you use an existing connection. Come hear how these solutions could work to your advantage across your remote locations. - What do I mean by “Hard to Reach Locations”? Businesses rely more and more on technology that touches their customers directly. This is especially true in remote branch locations like stores or restaurants. Whether it is digital signage for advertising in the product aisle, swiping a customer loyalty card at the gas pump, or simply taking a credit card at check out, when the network connection is down you are losing money and upsetting customers. Wireless and satellite technologies can provide very high reliability and surprisingly cost effective alternative routing solutions to your terrestrial network. Discover how these solutions could work to your advantage across your remote locations. 1) Executive mandate to "Do more with less"